Posh goalkeeper Luke McGee should play at Notts County. Peterborough United goalkeeper Luke McGee is expected to shrug off a knee problem and play in Sunday’s (December 4) second round FA Cup tie at Notts County. 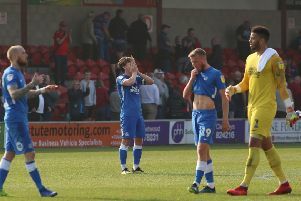 McGee was facing a late fitness test ahead of last Saturday’s (November 26) scheduled League One game at Oldham before the match was postponed a couple of hours before kick-off. Young Posh winger Harry Anderson has impressed on loan at Lincoln. Posh recalled young ‘keeper Dion-Curtis Henry from his loan spell at Boston United to cover for McGee. He would have sat on the substitutes’ bench with Mark Tyler replacing McGee. Henry will now stay with Posh with McCann claiming a spell in mens’ football has done the 19 year-old the world of good. “It’s toughened Dion up,” McCann stated. “He’s come back looking very sharp. It’s the same with Harry Anderson at Lincoln. League Two clubs have shown an interest in Anderson. Posh continue to try and extend McGee’s loan spell at the ABAX Stadium from Premier League Spurs and McCann has asked the club’s fans to play their part, in a negative way! Midfielder Brad Inman could be in the matchday squad at Notts County as on-loan George Moncur hasn’t been given permission to play by parent club Barnsley. Inman came through 70 minutes of yesterday’s (November 29) reserve team defeat at Southend.